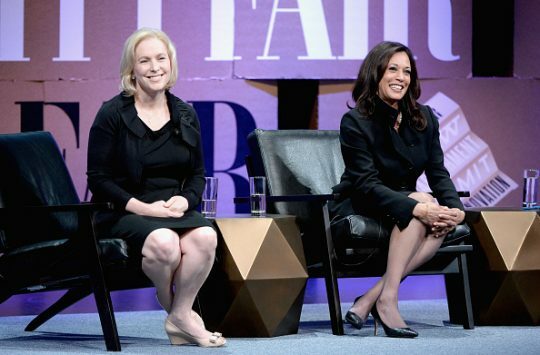 Sen. Kirsten Gillibrand (D., N.Y.) gushed over another entrant into the 2020 Democratic field in a new interview, saying Sen. Kamala Harris (D., Calif.) would be an "amazing president." Harris, after announcing her candidacy last week, officially launched her campaign on Sunday in front of an estimated crowd of 20,000 in Oakland, California. Both women are attempting to become the first female president after Hillary Clinton lost to Donald Trump in 2016. Gillibrand launched her exploratory committee earlier this month and already visited Iowa, but she is barely registering in the polls and has had to apologize for past conservative views on issues such as illegal immigration and gun rights. Her campaign is focusing on women's issues, but when asked by WNYCs Brigid Bergin if she could make the case as effectively as Harris to black women, a core demographic of the Democratic Party, she demurred. "Well I certainly wouldn't say it that way," she said. "I think it's amazing that Kamala is running and I think she's an amazing candidate and she'd be an amazing president. I think a lot of the Democrats that are running are incredible. They're all better than President Trump, we can start there and they would all do much better things for this country." "And I think it's great that we have four maybe five women running for president because it's wonderful for America to see what American leadership looks like in all its forms," she added. "And I think that the candidates, particularly the women candidates, will have a different vision for this country that is broad, broad-based and exciting and visionary." Gillibrand also said the Democratic Party wasn't as split as people think and predicted "small differences" would emerge in the 2020 primary, which could number more than 20 candidates. "I think we deeply care about fairness and opportunity for everyone," she said. "I think we very much believe that healthcare should be a right and not a privilege. We certainly want better public schools and we want higher education to be more affordable. I don't think Democrats want people to be laden with student debt and they're willing to fight against it. I think Democrats want to take on the drug companies to make sure that they stop gouging. And so I think there's a lot of unanimity about who we are, what our values are and what we're willing to fight for. I think you'll see small differences over the next year and a half." This entry was posted in Politics and tagged 2020 Election, Donald Trump, Kamala Harris, Kirsten Gillibrand. Bookmark the permalink.